Panax is derived from the Greek word 'Panacea' which means healing. The roots are full of therapeutic and nutritious functions for healing and increased energy level. It is the most trusted ancient herbal energizer that has been used to treat lack of libido and fatigue. The active ingredients are ginsenosides. OFFERING TOP QUALITY OF GINSENG ROOTS IMPORTED . ROOTS ARE BOLD THICK AND DRIED . We can give Original Ginseng roots ( Red Phanax Ginseng ) , good quality . See pics above . .
Payment advance . MOQ 5 kgs . Ginseng also has the medicinal properties so it is one of most important substance in ayurvedic medicine. 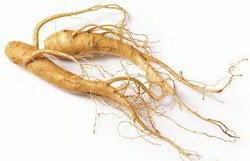 We provides natural and fresh Ginseng root, We are exporter of farm fresh pure natural Ginseng root. Ginseng mainely used for cognitive ability, mental agility, memory, stress and anxiety etc..
Arunam Spices (opc) Pvt. Ltd.
Ginseng Korean Roots chinese medicine used for various medical purpose.